Dalton Wing (left), 17, clowned around with co-captain Joseph Kalilwa, 17, from Congo. These are the defending state champs, the first in McGraw’s 34 seasons as head coach at Lewiston High School, and he pushes them relentlessly through drill after drill on a sizzling hot morning last week. No one seems to mind. Not the Somali boys, who make up the bulk of the team. Not the players from Kenya. Not the ones from Chad, or Angola, or Ethiopia, or Rwanda. Playing soccer on a field of lush Maine grass is a gift — a dream, really — compared with the refugee camps where many of the boys once lived. Every day feels great now for the Lewiston High soccer team, which ranked as high as 17th in the nation at one point last season. But its success extends far beyond the scoreboard. The Africans, who grew up in a land where soccer is king and one of few joys amid hardship, dominate the squad. Ten of 11 starters last year were Somalis, chattering in their native language as they darted around the field, and they are widely credited with building ties between the 7,000 refugees who live here and longtime residents who once resisted them. It is a team defined less by its excellence than its example of unity. The pursuit of harmony faces big obstacles. When GOP presidential candidate Donald Trump brought his campaign to Portland on Aug. 4, he suggested that Somali Muslim refugees in the state are potential terrorists and are driving up crime. Hundreds rallied in Portland the next day to protest Trump’s remarks, and the Lewiston police chief told the Globe that crime has gone down, not up, since Somalis began arriving here in 2001. On the practice fields in this small city of 36,000 people, the national political debate seems far removed. Black and white players mingle seamlessly. It’s all about the game, getting better, and trying to repeat as champions even though nine starters have graduated. 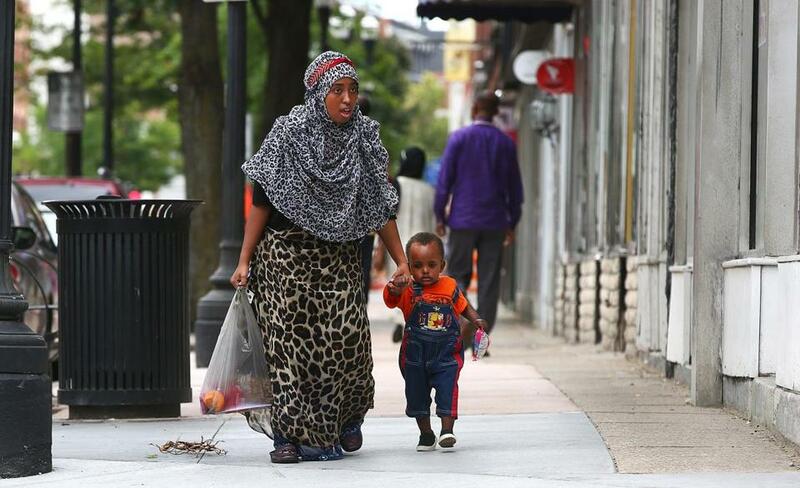 Lewiston’s mayor, Robert Macdonald, said several years ago that Somali immigrants should “leave their culture at the door.” But now, that culture has become as much a part of Lewiston as the red-brick walls of the 19th-century mills that line the Androscoggin River. Not only is downtown Lisbon Street dotted with Somali shops, but Somali families in traditional garb are a constant presence in the city. Mothers and sisters wear their hijabs, Muslim head coverings, to watch soccer practices. And Somali food has become a staple at the “snack shack” that feeds hungry fans at games. Tryouts attracted 62 players, about 50 from refugee families. They included Mohamed Yonis, a 16-year-old junior who was born in a camp in Kenya. Yonis leaned against a fence as he waited to be called to the field, set beside the hockey rink where heavyweight boxing champ Muhammad Ali defeated Sonny Liston in 1965. Nearby, twin spires reach skyward from the Basilica of Saints Peter and Paul, a towering legacy of French-Canadian immigrants who long defined the ethnic character of this city. Sue Ege, of Lewiston, walked on Lisbon Street with her 1-year-old son Amir Ibrahim. McGraw has preached acceptance since Somali and other African boys began joining the team over the last decade. Initially, black and white players rarely sat together during practice. McGraw responded by placing black boys among whites, whites among blacks. “I told them, ‘This is how you have to be on a team,’ ” McGraw said. McGraw brings an old-school sensibility to his new-world team. He’s a native of Lewiston, played soccer in the University of Maine system, and blends a big heart with a touch of boot-camp discipline. He’s all over the field during the practice, despite having a hip and knee replaced in the last few years. He’s been teaching at Lewiston High for 42 years and is regarded as a second father by many players. When he isn’t clapping for good plays or pointing out bad ones, McGraw is taking boys aside — to ask about filling out paperwork for the team, to remind them to get physicals, and to offer advice that helps both on and off the field. “You don’t have to take on the whole world, you know,” McGraw said quietly to Joseph Kalilwa, a 17-year-old from the Democratic Republic of Congo, who had just tried to dribble through the entire defense. For some of them, taking on the world is what they know. Many of the Somalis fled a horrific civil war to live for years with their families in teeming refugee camps. Lewiston — a long-struggling city in remote Maine — became an unlikely destination that offered safety, affordable housing, and low-wage jobs. Word of that spread from early arrivals, and the African immigrant population swelled. Life can be hard, even here, and the children sometimes struggle to obtain soccer equipment. Some share cleats with their brothers. Others do not have shin pads, so they stuff their socks with newspapers. One player showed up for tryouts with holes in his cleats and peeling soles. “Ouch; you can’t do that,” assistant coach Dan Gish told the boy. Studying a list of who made the soccer teams are (from left) Enock Citenga, an unidentified family member, co-captain Maulid Abdow, and Gabriel Labonte. That relationship extends throughout this soccer family, beginning with McGraw, who said he had dreamed of the state title since he began coaching. The dream became a reality when Abdow, this year’s cocaptain, scored the only goal in the Class A championship victory over Scarborough. On the field, Abdow is a quiet leader, calm and confident. At home, he is one of nine children who live in a four-bedroom apartment that is decorated and furnished with the look of their faraway homeland in the Horn of Africa. The growing sense of welcome here is balanced for his mother, Shafea Omar, by continuing concern about the overheated rhetoric directed at immigrants and Muslims in this election year. A block away from their home, “Trump” has been painted at the bottom of a stop sign in the heart of this Somali neighborhood. “Stop Trump” is the makeshift message. Abdow is still a kid himself, as evidenced by his room, where clothes are scattered about. 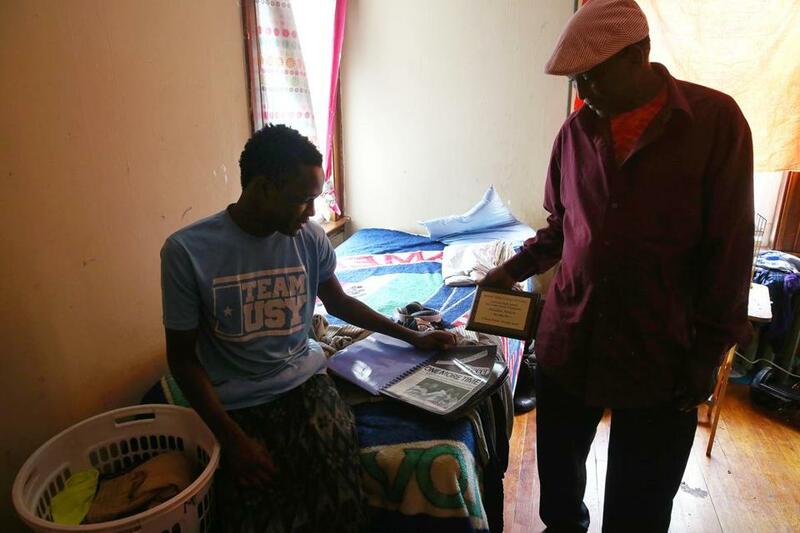 A US flag is woven into his bedspread, and championship T-shirts are hung up like trophies. His sister Mana, 12, proudly shows the scrapbook she has filled with page after page of press clippings about the team. “He means a lot to me,” Mana said with a shy smile. The skills of the African players set them apart during games — the only white starter last year was goalkeeper Austin Wing, who has graduated — but there is no separation afterward, white players said. “They’re just like our brothers, our family. There’s no difference,” said Dalton Wing, a 17-year-old senior who is Austin’s brother. Alex Rivet, a 16-year-old junior, agreed. “No one’s better than the other. Everyone has a heart; everyone loves sports,” Rivet said. Austin Wing recalled how he invited African players to swim in his pool, and how he readily agreed to keep his black Labrador sequestered because many Muslims shun dogs. Per Henrikson, the goalkeeper coach, said the diversity is invigorating. “This is the closest I can get to coaching overseas and still be in this country,” said Henrikson, 47, who played professionally in Pakistan. He agreed that the soccer team has helped bring the city closer, but he stressed that the journey is far from over. “It’s not all Kumbaya. It’s a slow process,” said Henrikson, who also helped coach Philippines and Bhutan national teams. Gish said he is learning something new every day as the process unfolds. He grew up on Loring Air Force Base in northern Maine, a place far removed — in culture and comfort — from the villages and refugee camps of East Africa where many of his players were born. No matter. They have brought something that transcends geography. Co-captain Maulid Abdow, 18, and his father, Hassan Matan, pulled out a book of news clippings.